In 1870, Canada sent a military expedition to the Red River Settlement to oversee the transfer of political control from Louis Riel's Provisional Government. Led by Colonel Garnet Wolseley of the British Army, the force consisted of about 800 workers and voyageurs, 417 British regulars, and 783 Ontario and Quebec militiamen. 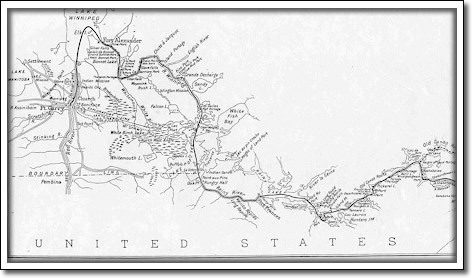 Denied access to American railways, Colonel Wolseley's contingent required two full months to complete the arduous journey from Thunder Bay to the Winnipeg River. On August 24, 1870, they took command of Upper Fort Garry, which had been vacated recently by Riel and his followers. The presence of Wolseley's volunteers heightened the already strained political, cultural, and religious tensions in Red River society. Many militiamen remained in Manitoba and were followed by other Protestant Ontarians. Their numbers changed the balance of the French and English-speaking population and led to a Manitoba which reflected many of Ontario's social and political structures.